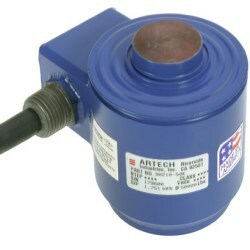 Artech 90210 is a multicolumn compression type load cell. It is hermetically sealed to provide better environmental protection. The cell is recommended for tank, truck, track and hopper type industrial applications. Integral 30 foot cable. 10K - 500K pounds capacities. Stainless steel version available. Artech Industries 90210 is a multicolumn compression type load cell, available from Central Carolina Scale. It is hermetically sealed to provide better environmental protection. The cell is recommended for tank, truck, track and hopper type industrial applications. The cell is supplied with an integral 30 foot cable. • Better Prices than many of the "Brand Names"